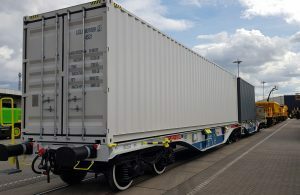 United Wagon Company won the tender launched by Deutsche Bahn to supply Sggrs80 articulated container flat cars. By 2020, UWC will supply DB a total of 130 cars and there may be an additional option for another batch of flat cars. 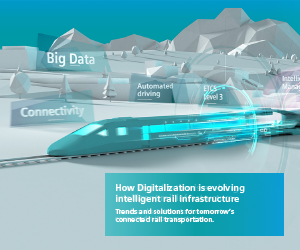 “I am very pleased to welcome UWC as a new supplier for Deutsche Bahn. We rely on strong suppliers such as UWC to help us further increase our rail freight business. 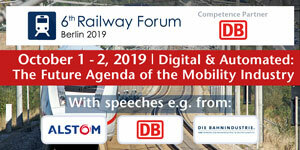 We look forward to receiving first freight cars from Russia,” Martin Kretschmer, Head of Procurement of Deutsche Bahn said. The 80-foot articulated Sggrs-model flat car has a payload capacity of 108.6 tonnes, enabling it to transport various standard-sized ISO containers, tank containers and swap bodies with a gross mass up to 36 tonnes. The flat car is designed to be more light-weight than standard analogues now operating in Europe. The bogies have an axle load of 22.5 t and the car is intended for operation on the 1435-mm rail gauge. The articulated flat car was designed by United Wagon Company’s R&D Technology and Transportation Centre. The cars for the European market will be manufactured at UWC’s production site in the town of Tikhvin, in Leningrad Region. The car assembly certification for compliance with the European TSI standard will be carried out by the end of 2019. 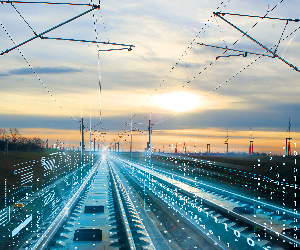 UWC has worked successfully on a technologically challenging project to design and manufacture rolling stock that meets DB’s stringent requirements. In August, Deutsche Bahn awarded UWC the Q2 quality status, following a quality audit process which allows the rolling stock producer to supply freight cars to DB. United Wagon Company’s entrance to the EU market represents a major breakthrough for the company’s export strategy.